The Hitachi CP-BW301WN 3000-Lumen WXGA Short Throw LCD Projector has a native resolution of 1280 x 800 with a throw ratio of 0.4:1. It has two VGA, two HDMI, and composite video inputs; one of the two VGA inputs also serves as an output for loop-through. Its built-in 16W speaker will provide audio, so external audio may not be necessary. It is controllable via Ethernet, RS-232, or the included IR remote. Hitachi's Accentualizer technology is designed to make pictures look more real by enhancing sharpness, gloss, and shade to make pictures as clear as they'd be on a flat-panel device. You can also adjust the effects of these three settings according to your surroundings so that the colors of projected images are the actual colors of the objects they represent. Using HDCR, blurred or dimmed images caused by room lighting or outside light sources are corrected, resulting in clear images even in bright rooms. 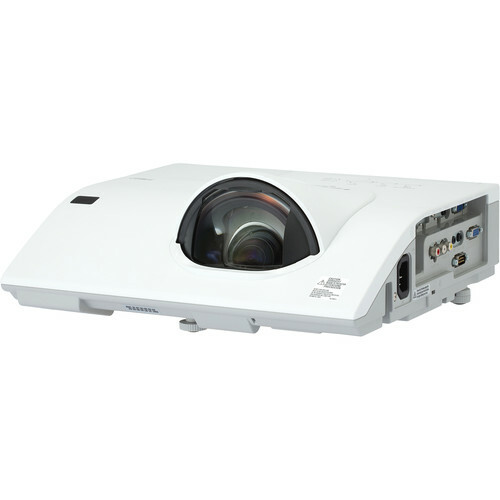 Hitachi's application offers full projector control and provides the capability to display photos, document files, and website contents. Available for iOS and Android devices, the app works when the projector is connected to your network via your RJ-45 port or an optional USBWL11N wireless adapter. Embedded networking gives you the ability to manage and control multiple projectors over your LAN. Features include scheduling of events, centralized reporting, image transfer, and e-mail alerts for reactive and routine maintenance. Hitachi's suite of networking software allows you to easily send content directly from your computer to the projector via your LAN connection. Connect the projector to a computer or your network using the optional USBWL11N USB wireless adapter. Copy configuration settings, including gamma, keystone, and more, from one projector to others of the same model via USB memory. Automatically changes the brightness of the lamp according to the brightness level of the screen. Also, automatically changes the brightness of the lamp if there is no change in the screen image. Paired with ImageCare technology, these features are designed to give optimal picture performance with maximum energy savings. ImageCare is a lamp power control function that is designed to combine optimal picture performance with maximum energy savings by decreasing energy usage, improving contrast ratio, and lengthening lamp life. By using a USB memory stick or other storage device, you can use the projector without a computer. Menus are easy to see with a thumbnail display, plus there is also a slideshow function. PJMessenger allows you to send and display text messages and audio alerts on your networked projectors. It is an easy and efficient way to send announcements out to multiple units. PIN lock protection can limit projector users. MyScreen PIN lock keeps captured images on the startup screen. You can set any name or logo to MyScreen, clearly identifying ownership. MyText provides the ability to write text on the startup screen such as model name, serial number, or location. Rename your input sources in more descriptive terms instead of the factory default names. A microphone can be used via the jack located on the input panel, allowing for more dynamic presentations even in standby mode. With optional USBWL11N wireless adapter. Box Dimensions (LxWxH) 18.3 x 14.7 x 7.7"